Well, this has been a different week for us. We've been to Kuching and Mukah on seminary and institute preschool training. We traveled with President Lai, the Stake President and S&I coordinator for the Singapore Mission. We attended two trainings and one graduation. The good news is that neither of us had to speak at graduation, but we did take part of the training time to cover a couple of preassigned items. We called Elder and Sister Slider while we were in Kuching. They were in the MTC with us. We were able to spend some time with them, which was nice. They drove us around Kuching. We were able to get our last Twinrix Hepatitis shots while we were there. That was a bit of an adventure in the hospital there having that done. We ended up at the hospital because Elder Slider needed to pick up some information there. Sister Bodell decided that it would be a good time to see if we could get that done. It is done. No more worries there. We stayed in a beautiful new hotel. I looked at the bathroom when we walked into our room and decided we had died and gone to bathroom heaven. I've never been in a hotel this nice. There was a nice shower in the tub and a separate enclosed shower as well. The toilet came equipped with a bidet. There were also bathrobes! The breakfast was excellent, but it's interesting to know that the people here will eat rice and noodles for every meal, including breakfast. There were some other interesting foods, too, but the omelets were good. They also had pancakes and waffles, but no maple syrup. Maple syrup is not something you see here. We were able to take some time and walk down to the river and do a little sight-seeing. We thought about taking one of the river trips, but decided not to this time. Good thing, too. During the time we would have been on the river, the clouds opened up and dropped everything. Boy, did it pour rain! 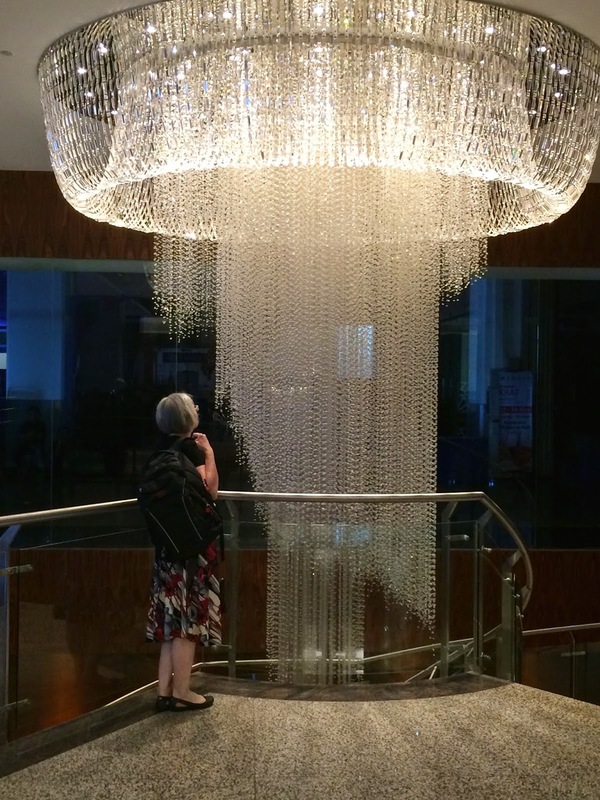 Sister Bodell was mesmerized by this chandelier in the hotel! This was a view of the river in Kuching, before it started rainging. The large building in the middle is their state government building. we'd like to do this in the morning, before it rains! 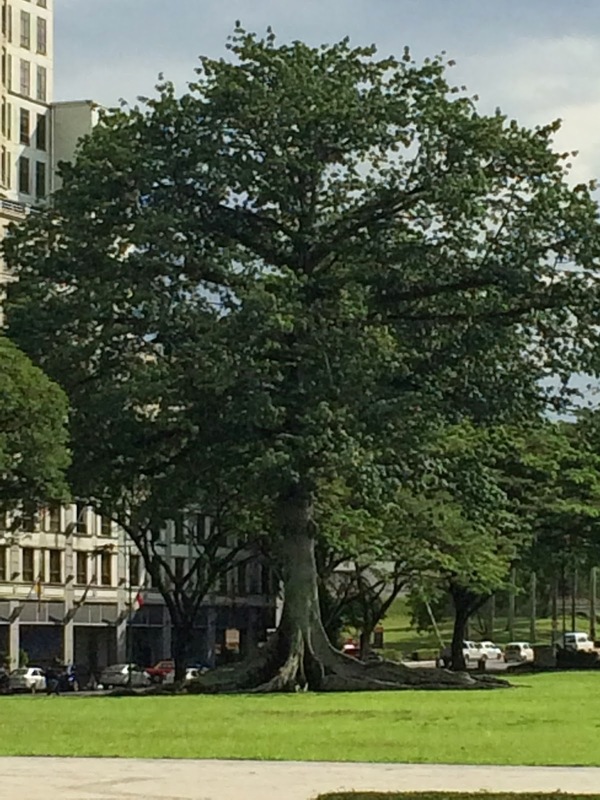 You may have to enlarge this picture, but the root structure at the base of the tree was amazing! We flew to Kuching early Tuesday morning, and flew out early Thursday morning. We rested up a bit after getting back to Sibu, then got in the car and drove to Mukah. It was a pleasant drive, except for passing and being passed, but the road wasn't bad. I was expecting something much worse. We were pleasantly surprised when we reached Mukah. It wasn't a totally back water town. The hotel could have been much nicer. It was quite a few steps down from the one in Kuching. Next time we're staying at the newer one. Mukah is a predominantly Muslim town. 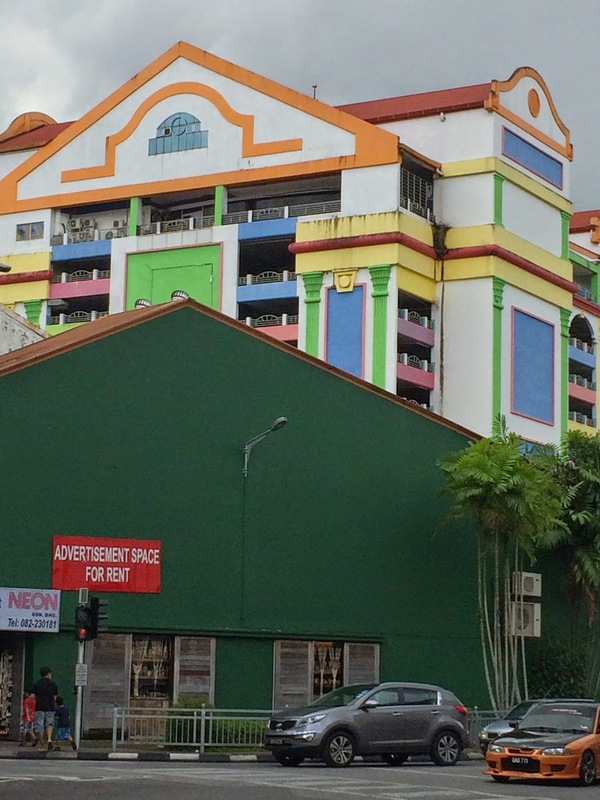 There is a mosque located very near the hotel. Fortunately, we were on the opposite side of the building. Otherwise we might not have gotten any sleep. Check out this video. The chanting goes on for hours! We attended and help teach the seminary preschool training in Mukah. There is one branch so only one seminary teacher. There isn't an institute teacher, but the new senior couple, the Tedrows, volunteered to teach it. The branch in Mukah will have to get a new seminary teacher in the near future. The young man who is teaching will be going on a mission in a few months. Friday morning we drove back to Sibu and slept! I didn't know traveling could make you so tired! We managed to get going later and work on our Temple Prep lessons and get some errands run. We also had the missionaries do some translating for us for our lesson this week. Things settled down Saturday. The Chinese Branch had a Thanksgiving dinner. The missionaries and senior couples were all invited. They did present one very large roasted chicken spiced the Chinese way, but it was good. I wouldn't call it a traditional Thanksgiving meal, but it was good. Time to close now. Time to get ready for church.